Woodworking can be an enjoyable and rewarding hobby. For some, though, the skill and equipment that some woodworkers have may seem daunting. Even the most masterful woodworkers were beginners at one point, however; don’t assume that just because there are highly-skilled people doing woodworking that skill is a prerequisite to learning how to work with wood. If you’re interested in learning how to work with wood but aren’t sure where to start, here are a few suggestions to get you started. The first thing that you need when working with wood is some basic equipment and a place to actually be able to work safely. If you have a makerspace in your area or another public workspace, that could be an ideal location, since you’d have access to tools and equipment without a significant expense. If you have friends with woodworking tools then using their equipment might also be an option. If you can’t access the tools any other way, you may be able to rent what you need from certain hardware stores. Whether you’re renting, buying or using other accessible equipment, there are a few key components you’ll likely need to get started. This includes a sturdy workbench, marking and measuring tools, a circular saw or tablesaw, wood glue, sanding equipment, and clamps. There are a lot more pieces you’ll probably want to add down the line, but these basics should be enough to get you started. Before you ever turn on a piece of equipment, take the time to familiarize yourself with the safe operation of every tool you’ll use. Learn about basic woodshop safety and make sure that you have eye, hand and breathing protection that’s adequate for the job at hand. 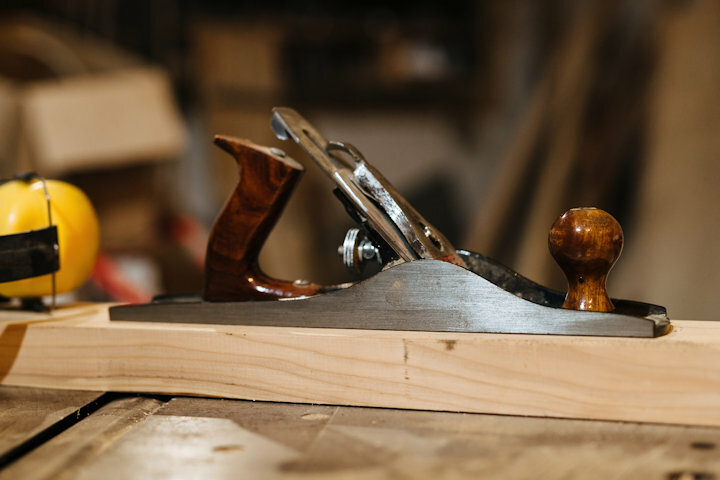 If you feel like you’re going overboard on safety, you may not be going far enough… woodworking can be dangerous when you’re inexperienced, so this is when you really need to go the extra mile to stay safe. Establishing good safety habits now will keep you safe both starting out and down the road. You may have some dream projects in mind, but there’s a reason that the stereotypical first wood shop project is a birdhouse. Select a beginner project that’s simple, ideally one that will require basic measurements and cuts to complete but doesn’t need anything intricate. The goal is to learn how to use the equipment and how to work with the wood, not to create a work of art for the ages. Your first few projects should all be relatively simple, though you can gradually increase the intricacy as you become better with the basics. Once you have a solid grasp on the basics of woodworking, slowly start expanding your skills and the types of equipment you work with. Select a basic project that uses a jigsaw, router or a lathe to expand your skills in new directions. Attempt more intricate cuts than you’ve done with past projects. Don’t make any major leaps, but feel free to push your limits and expand into new areas once you’re confident with the work that you’re doing. Just make sure that you learn any relevant safety procedures for new equipment before you get to work. As you begin exploring your options beyond that first project, take the time to seek out other woodworkers both in your area and online. Not only can they give you tips, critiques, and suggestions on the work that you do, but you can also make new friends based on your shared interest in woodworking. Seeing what others do and being able to ask them questions about their work may also inspire your own growth as a woodworker, giving you ideas for future projects that you might never have considered otherwise. Hi all, was looking for a good source or whirligig plans either free or paid...any info is appreciated!